instantOLAP is a full-fledged OLAP system with models, dimensions and cubes. Your relational databases are mapped in real time in cubes. It provides drill-down, drill-through, a flexible programming language, and all the functionality and tools needed to build an OLAP system. With instantOLAP, you only need a browser on your desktop or mobile device to view or create reports. The AJAX Web Portal includes an easy-to-use report designer for all users and a powerful query editor for experts. Any desired report can be created. 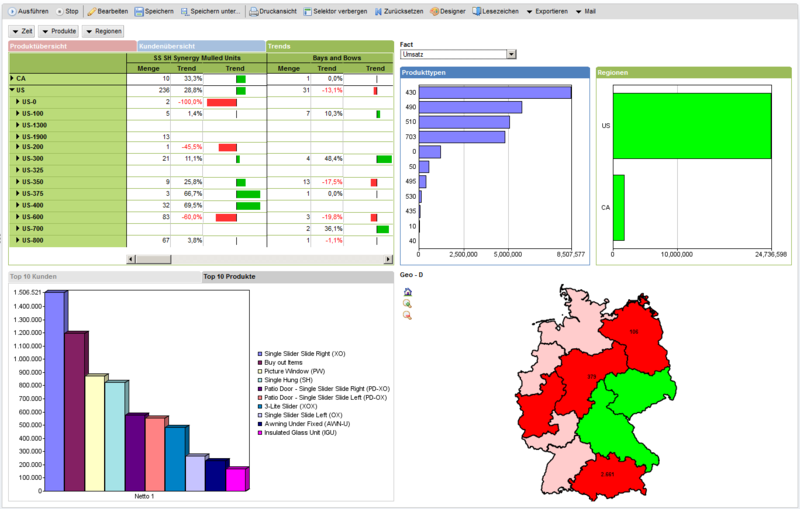 Create concise dashboards and reports with instantOLAP. Our portal supports dynamic pivot tables, interactive charts and geo-charts. Interactive controls can be combined with any report or dashboard. Users can export the reports to PDF, Excel, CSV or as XML files, send by email or subscribe timed. You can publish your own PDF documents or edit HTML files online. Just everything a report portal needs – completely web based! instantOLAP is completely implemented in Java and therefore works on almost any platform – from Linux or Windows servers to mainframe systems. Use your existing hardware, just scale from a server to a bigger one: instantOLAP runs wherever you want it. instantOLAP has been used by many corporations for years and is designed to work with large, complex and heterogeneous databases. instantOLAP has no limitations, such as linking only a database, a star schema or the like. First, use instantOLAP as a ROLAP system and, if necessary, expand your model with just a few clicks of the mouse around high-performance MOLAP cubes. Or use both technologies simultaneously as HOLAP. instantOLAP uses a powerful SQL generator for adhoc queries and an impressive compression technology to aggregate data into MOLAP cubes. The simultaneous use of both techniques is possible without restriction – just as you need it. Download and install instantOLAP in minutes and instantly create your own OLAP cubes and reports. Our standard distribution installs everything you need, including a server, a demo database with sample reports and a free user license! You prefer to create your reports with Microsoft Excel? Class; the instantOLAP server is not limited to the use of our web portal. It also supports the XML / AStandard for connections to Microsoft Excel and other OLAP clients, is compatible with the Microsoft ODBO driver, and communicates with a subset of MDX, the de facto default query language for OLAP servers. For product details see here. based on instantOLAP. As an online service developed by us and hosted for GfK. OLAP systems + development tools. With this OLAP product we have grown up “big” and in almost 20 years we have implemented countless projects with it. This tool is an adaptation of our OLAP system (formerly ScaMIS) based on Oracle Express, which was especially developed for raw data analysis.